W. W. Norton & Company, 9780393082821, 244pp. What's wrong in Washington is deeper than you think. Yes, there's gridlock, polarization, and self-dealing. But hidden underneath is something bigger and more destructive. It's a broken governing system. From that comes wasteful government, rising debt, failing schools, expensive health care, and economic hardship. Rules have replaced leadership in America. Bureaucracy, regulation, and outmoded law tie our hands and confine policy choices. Nobody asks, "What's the right thing to do here?" Instead, they wonder, "What does the rule book say?" There's a fatal flaw in America's governing system--trying to decree correctness through rigid laws will never work. Public paralysis is the inevitable result of the steady accretion of detailed rules. America is now run by dead people--by political leaders from the past who enacted mandatory programs that churn ahead regardless of waste, irrelevance, or new priorities. America needs to radically simplify its operating system and give people--officials and citizens alike--the freedom to be practical. Rules can't accomplish our goals. Only humans can get things done. 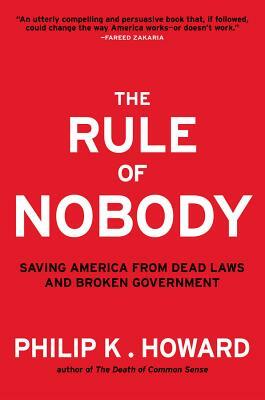 In The Rule of Nobody Philip K. Howard argues for a return to the framers' vision of public law--setting goals and boundaries, not dictating daily choices. This incendiary book explains how America went wrong and offers a guide for how to liberate human ingenuity to meet the challenges of this century.